Last modified on June 14th, 2018 by Vincy. In the Amazon-like online store, the product gallery shows the product images with limited details as price or any. If we want to see a quick look for more detail about the product then it will be displayed with a modal window without page redirect. 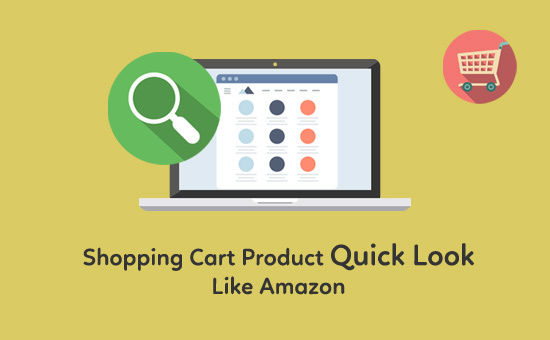 Let us see how to show product modal window on clicking the Quick Look button in the PHP shopping cart product gallery. I have created shown a responsive product gallery for a shopping cart application. The gallery shows the product images in a card view. While hovering the card element I have shown the Quick Look ghost button on top of the product image. On clicking this button, I have called jQuery AJAX function to get the product information and show with a modal window. 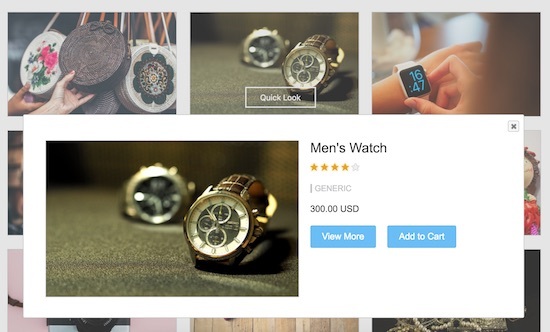 The modal window will contain the Product name, enlarged preview image, price and more details. I have created this product gallery HTML by fetching the product result from the database. The database result is iterated to display the product gallery images with the Quick Look button control. This control is added with the jQuery show hide effect on hover the gallery card element. This buttons click event is mapped with a jQuery function to show Product modal window with more detail. This jQuery code shows the AJAX function requesting PHP page to get the product details. It passes the product id as the parameter with the AJAX call by specifying the request method. This parameter is received in PHP and used in the MySQL query statement to fetch the product information. In PHP page, the resultant product information is used to form the HTML to display the modal window. This HTML will be sent as the response to the AJAX call which will trigger jQuery modal on the success callback. Below screenshot shows the output of the product view modal by handling the quick look request. The figure shows that the modal disables the background screen by popping the modal window onto the top.